"Where the abnormal is normal." Jane has a degree in interior design, and owns a "haunted bookstore." She shares her interesting finds here on her blog: zombie gnomes; zombie pops; a creepy baby lamp; and a hilarious Cthulhu weenie roaster. Bane's "handygoth" blog with tips on frugally, practically gothing your home decor up all by yourself, whether furniture, clothing or decorative items. Recent posts include goth ceiling tiles; a gorgeous stripey curtain valance; and a thought-provoking post called "I Am My House." This spooky artist works with stamping and polymer clay. I love that her blog showcases her handiworks with generous amounts of pictures, but isn't just a "buy this on etsy!" blog like so many goth crafty blogs I've bumped into lately. Her recent creations include a garden of good and evil complete with zombified frog; some adorable St. Patrick's Day skulls; and an adorable creation featuring a cartoony Gomez Addams. 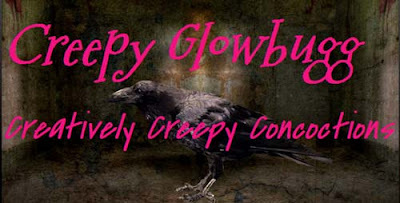 You might also enjoy checking out her other blog, Haunted Design House. "A Closeted Goth Girl Trying to Make it in the Professional World." I wonder if this young lady is a member of Corpgoth. She can't dye her hair wild colors, so makes up for it with well, aptly named, makeup! She shares pics of the fabulous way she's done her eye makeup, several times a week. I love seeing what she's experimenting with lately. I also like to see the occasional outfits she shares. She's always careful to include pics of the cosmetics she's using, and info on exactly which cosmetics (and clothing brands) she uses to put together her look each time. Love her enthusiasm and spirit! "An exhumation of first wave Goth and Death Rock, 1979-1988." This well-informed Australian blogger looks at goth music as coming in three waves: the first, influenced by post-punk; the second wave influenced by rock; the third by dance and EBM. Besides covering important early goth bands here (including Fields of the Nephilim, The Mission, and Sisters of Mercy, posts here include much lesser known acts: Cadaver Finesse, Anorexic Dread and more. I highly recommmend this blog for people new to goth or goth youngsters who missed all this info and great music the first time around. GIY: Goth It Yourself and Domesticated. I look for cool blogs by finding one, in this case it was probably the recently renamed Stripy Tights and Dark Delights and seeing who that blogger reads, and by noting who makes interesting comments. Thanks for the others mentioned - I've just been enjoying Plunder the Tombs and look forward to checking out the others. Thanks so much for giving Plunder The Tombs a mention! Thanks for the very complimentary shout out on your post yesterday. It's nice to know your blog also exists. Thank you for listing GIY on Really Cool Goth Blogs! Aww, thankyou for listing me! I wouldn't consider myself an eldergoth yet though! I'm not quite thirty yet! My partner's 29 and I'm a few years younger than him. I've spotted that you've changed it, thank-you. I don't want to claim eldership I don't deserve. I'll leave that to those who were wearing black in the early '80s.